The second highest pass in Europe after Col de l’Iseran. Originally built in 1820-1825 by Austria to connect Lombardy, then part of the Austrian Empire with the rest of Austria. As one of the most famous Alpine roads this is a must do ride. 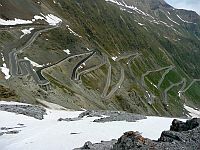 Our suggestion would be to ride it from the western Bormio end and descend on the eastern ramp towards Stelvio. The western ramp climbs for 12 miles. Initially fairly open you have to negotiate a few hairpins before the road straightens up, following the side of the mountain and passing through several tunnels which are generally wet and dark. Take care as there are some sharp bends in the tunnels. After the tunnels end you have a clear run up to a series of 14 “tornanti” or hairpins which take you up to the next level. These hairpins are not too tight, at least compared with those on the eastern ramp. At the top the road flows nicely for a mile or two, passing the junction with the Umbrail Pass road running north/south to Santa Maria in the Mustair valley – the start point of the Ofen Pass. You then have a final climb up some gentle bends to the summit of the pass, where there are a number of hotels, shops etc. If you want to go a bit higher then head off to the right and up to the Tibet restaurant which gives you a great view of the eastern ramp. The eastern ramp is notorious for its 48 hairpins – 2 early on and then a short respite before 46 consecutive hairpins, all of which are numbered. These hairpins are uniformly tight and your bike handling skills need to be up to the task of successfully negotiating them, especially the right handers. We saw a number of bikers running wide – it’s easily done – so if you ascend from the east then take your time.